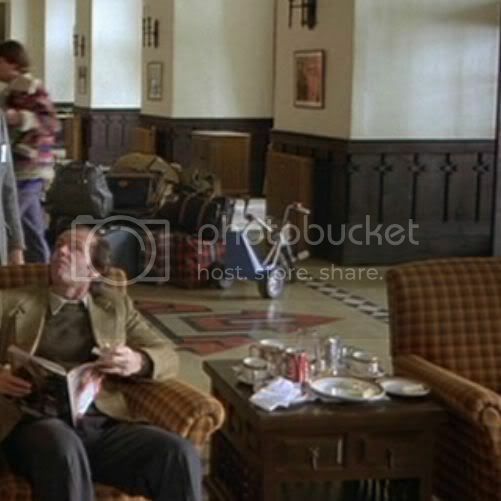 Frequently Asked Questions in "The Shining": Examples of Doubling in Stanley Kubrick's "Shining". Frequently Asked Questions in "The Shining"
Examples of Doubling in Stanley Kubrick's "Shining". There are no important examples of doubling in Stephen King’s novel; they were added into the movie. But doubling is mentioned in the novel and I believe it's where Stanley Kubrick got the idea from (click here). I've shown some of the obvious visual examples that he include in his film ... and a not so obvious hidden example of doubling (click here) he secretly included. The 2 Grady girls who are different ages in the novel inexplicably become twins in the movie (played by Lisa and Louise Burns). 1 single elevator in the novel becomes twin elevators in the movie. 1 single boiler in the novel becomes twin boilers in the movie. 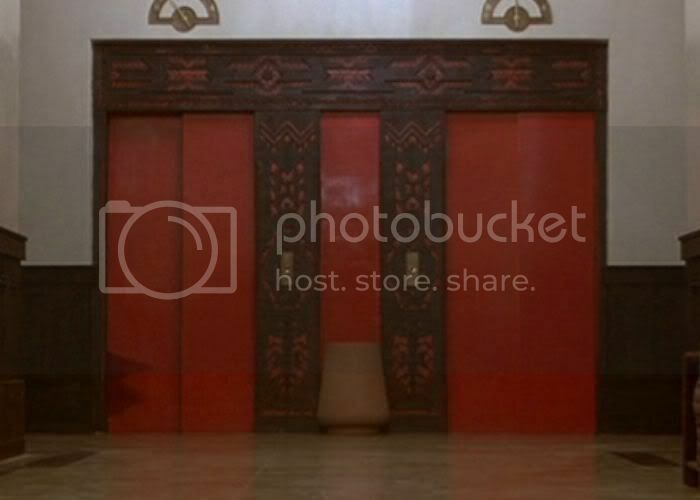 And don't forget room 237's double door (most of the other rooms have single doors). 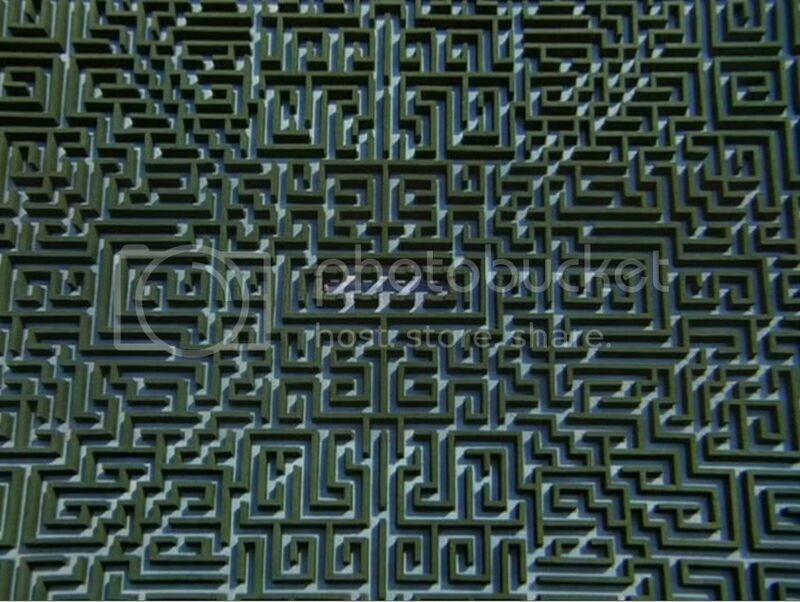 There are twin sides in Jack’s symmetrical vision of the hedge maze. 1 woman from the novel in the bathroom of room 217 becomes 2 women in the bathroom of room 237. 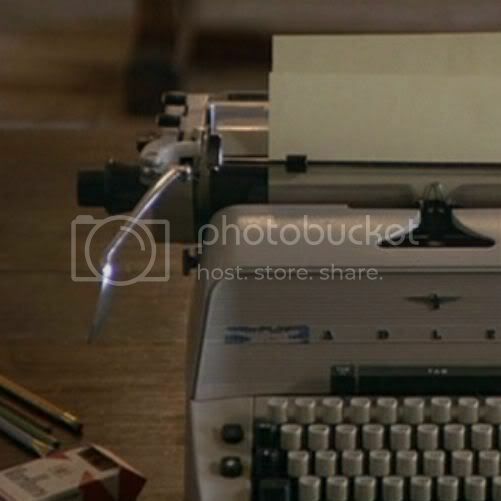 1 typewriter in the novel becomes 2 different colored typewriters in the movie and the paper Jack’s novel is typed on is 2 different colors seen in 2 different boxes on his desk. In the novel 1 door is unlocked by a supernatural power (the storeroom). 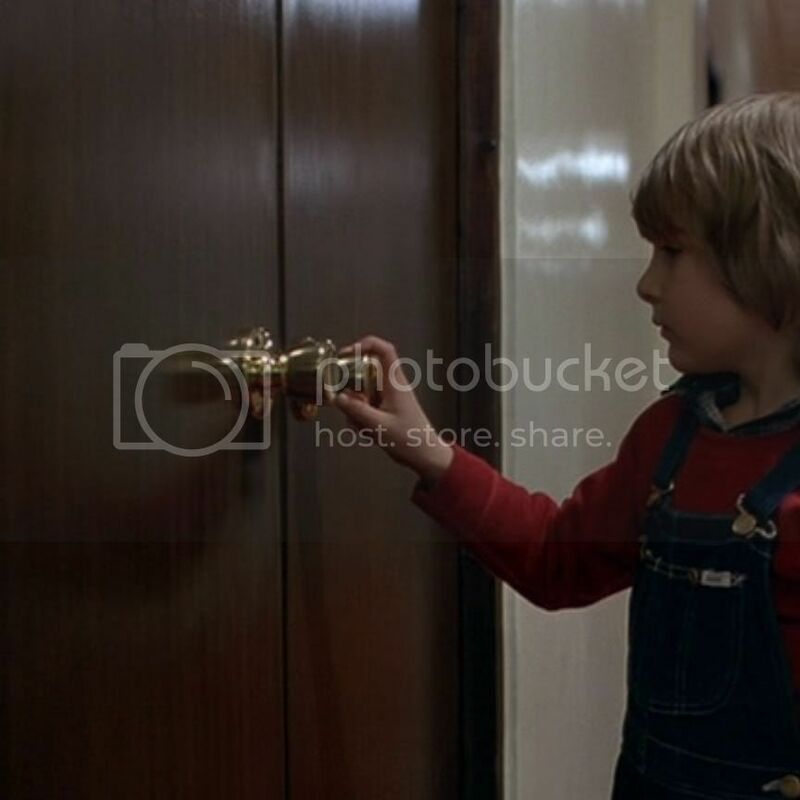 In the movie 2 doors are unlocked by a supernatural power (the storeroom and room 237). 1 vision of “Redrum” in the novel's bathroom mirror becomes 2 separate visions of “Redrum” on the bathroom door. 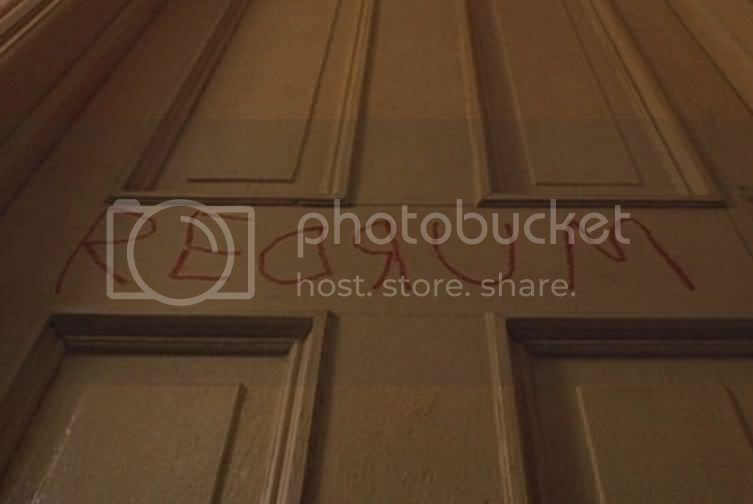 Not only are the doors different, but "Redrum" is printed 2 different times (look closely at the M and the middle R). 1 Grady from the novel (Delbert) becomes 2 in the movie (Charles Grady and Delbert Grady). There are also Danny's double trikes. On one the wheels are white and the other red. This is all so obvious. Even the vision of the bloody elevators that Danny and Wendy both see is a double. 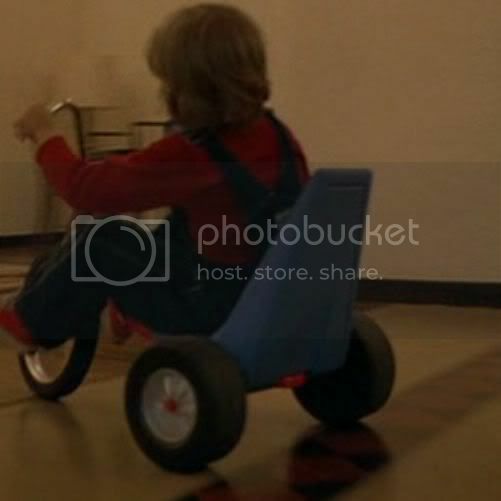 Stanley Kubrick goes way beyond meticulous here and you have to observe this scene very carefully. The scuff marks on the floor in front of the elevators show us that the point of view is different both times we see the bloody elevators so even though they're seeing the same thing frame for frame each vision is totally unique to that character; they are seeing twin visions of the same thing. The scene was shot with two adjacent cameras (Wendy’s on the right and Danny’s on the left) giving each character their own unique point of view. Doubling is shown in the dialogue. “White man's burden, Lloyd my man. White man's burden” is doubled and repeated twice and “For ever, and ever and ever” is also doubled. Jack also has 2 $20's and 2 $10's in his wallet. Doubling is even in the music we hear. The movie starts and if you listen very closely to the theme song it begins with a 20 note sequence followed by a 13 note sequence, doubled by being played twice. The theme song is a loose adaptation of this, “Symphonie Fantastique- 5th Movement” by Berlioz, and starts at 3:20 into the song (click here). There just happen to be 21 double letters (click here) seen in the cast member’s names in the credits. 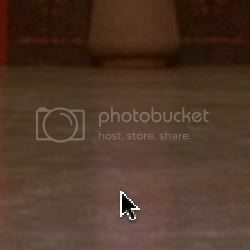 Even actors from the deleted scene are included. 42 is the double of 21 and 24 is the double of 12. And lastly the number 11 on Danny's sweater. An important double number and mirror image of itself (12 + 12 = 24, 21 + 21 = 42, 1 & 1 = 11). 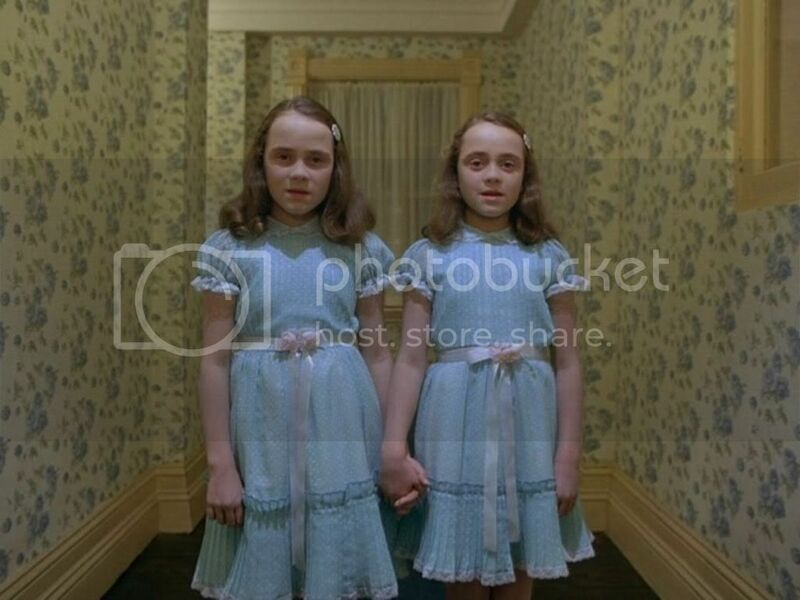 Here are some less obvious examples of what might be loosely considered doubling that Stanley Kubrick includes in “The Shining”. 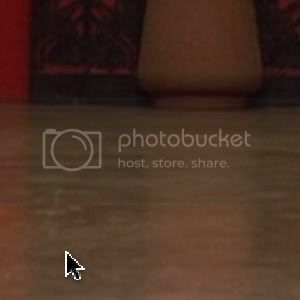 Click here and go back to my blog with over 500 interesting pictures from the movie, and read more. 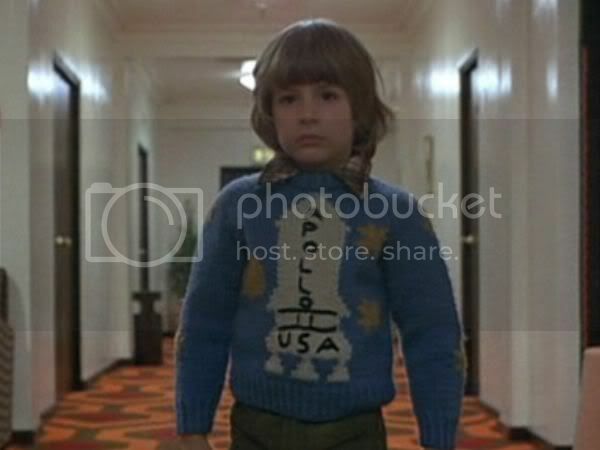 Does Danny actually go into room 237?